If XRP were to climb to $100.. would you sell everything? 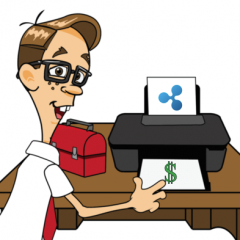 Imagine for a second you had $1 million to $10 million in your account at $100, and then some bad news came out regarding the company, a major lawsuit, banks decide not to use xRapid, Ripple management makes a decision which is great for the company, but eradicates XRP investors portfolios.... any unknown variable.. ..which led to XRP crashing to $0.05 and never recover. seeing it has not happened, its very easy for people to say, "id be ok with it because..." but imagine you actually had $1 million in paper profits, knowing you could have sold... but then watched your portfolio drop drop drop to nothing. Are you planning on risking a million for higher profits knowing that at ANY time, some unknown variable could cause XRP to crash? i know several people in here already had close to a million @ $3.. but lets say thats it. that we never recover. that 5 years go by, XRP is still at .80 cents.. and then crash. over. done. dead. failed investment. regrets? Hi folks, been almost 1 week since I transferred Ethereum from coinbase to GateHub no deposit and no response from GateHub. Should I report to FTC? Any suggestions?